Initially, this movie starts off with a slow melancholic vibe. I sort of wanted to stop watching at around its 10 minutes run, but after that the story would pick up and things would make sense. I was in denial the whole time though, feeling that it was all unreal, but the fact that this is about life and death… I swallowed that bitter taste at the back of my tongue and bravely watched on despite knowing that I’d end up in heart break and tears. What I liked about the movie is that it showed how significant a simple thing can be. Like phones, or movies… even cats. Have you ever imagined not having cats around? That being asked, this movie has a statement. It could be an eye opener or a sleep inducing kind of show. Depends on how you would perceive it as you watch. The story line is really heartfelt and yes, sad. I would have to say it hence I put your hopes up that this is going to be a happy movie, because come on and let’s face reality! Not everything has a happy ending. However, along the journey we get bits and pieces of lessons learned and lifelong good memories. The sub-characters are a plus point for me here even though I find the main character lacking. 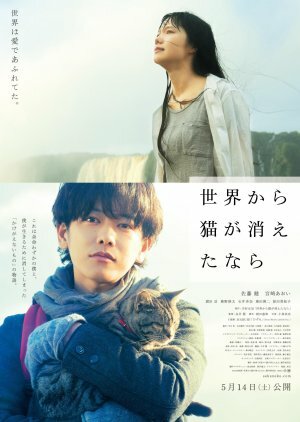 I have nothing against Sato Takeru as the main lead, but I find his character a bit of a pacifist. For someone who is about to die, I feel that he’s not much determined to live even at the beginning. Anyway, putting my thoughts aside, my favorite character would be the best friend. Hamada Gaku known as Tatsuya the nerdy looking guy who manages a movie rental store. I for one would love to have friend like that, someone who would think that their friendship is a never ending cycle because of a certain connection that they have. Other characters worth mentioning are: Aoi Miyazaki and Harada Mieko. I honestly watched this film because of Aoi and as usual, she never fails to trigger my heart strings whenever I see her on screen. I think her character as the girlfriend has more debt than Takeru’s. Harada on the other hand who acted as the mother portrayed a woman who cared and loved his son as much as she could. Music wise, it was a beautiful accompaniment to the film’s sad undertone. The mood was perfectly set because of the melody and if the movie ran without the music, it would have been boring and pointless. Cinematography was also amazing, the aerial capture and the video angles gave this vibe that there is more to life than it seems. It had vibrant colors and then dull ones, which seemed to let the viewers feel what the characters on screen are actually feeling. I rated this movie 7.5/10 due to the main character's flaw and the melancholy feeling the film gave me all throughout. I'm a rom-com kind of girl and being unhappy isn't my forte. All in all, I would still recommend this show even if it’s not a feel good one, but for the lessons we could learn and for the things we take for granted. It has a statement and a very lovely one at that.